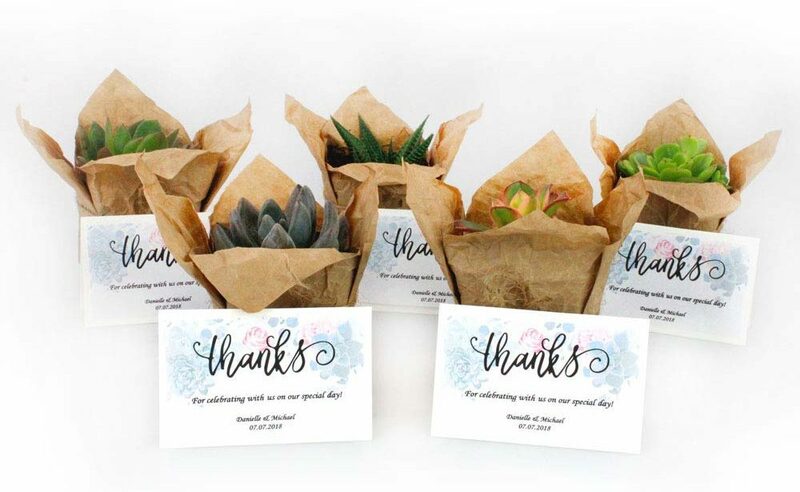 Wedding favors can be a nice way to show guests how much you appreciate their presence and support. Finding creative favors that don’t break the bank can sometimes be difficult though. 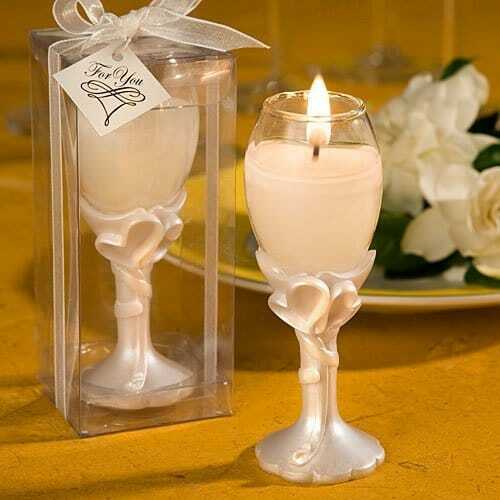 In this list of the best wedding favors, we detail 25 different wedding favor ideas for you. These favors will impress your guests but still leave some money in your wallet. 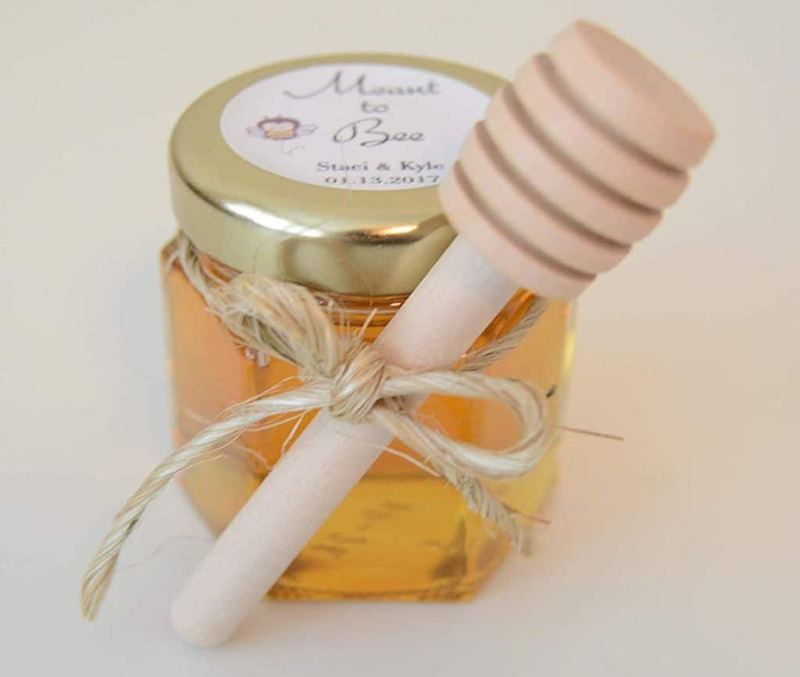 Some of the favors on this list are DIY, while others can be bought for a reasonable price. 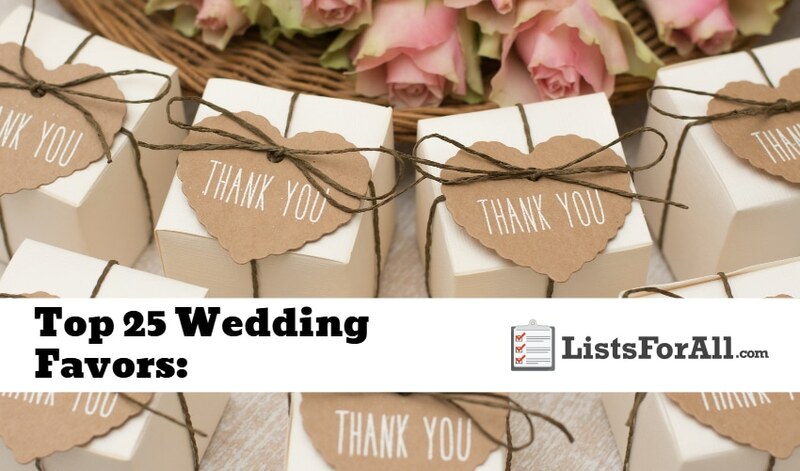 So no matter your budget or talent, there is sure to be a wedding favor on this list that speak to you. For even more wedding related ideas, visit our list of the best wedding dresses and best wedding songs. Happy wedding planning! 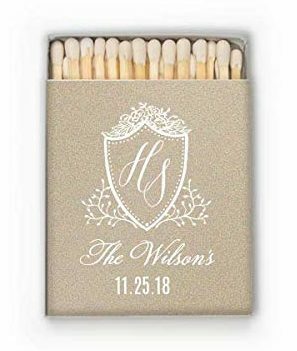 When you think of wedding favors the first thing that pops into your mind is most likely not S’mores. 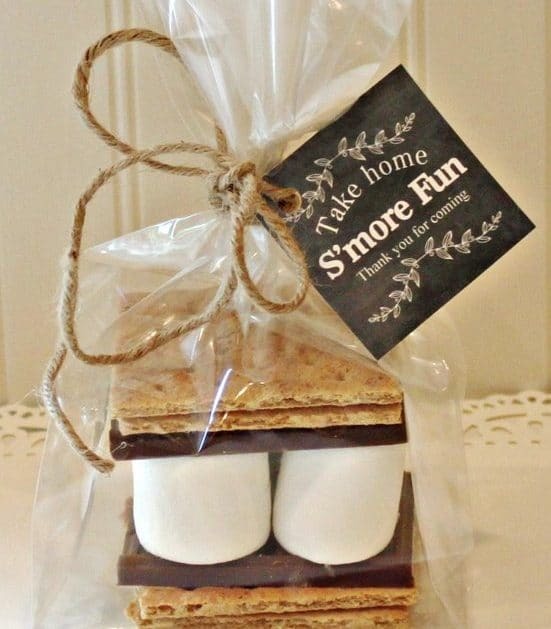 These homemade S’mores kits look great though (especially for outdoor weddings)! They will make a great take-home gift for your wedding guests. They are also very budget friendly. 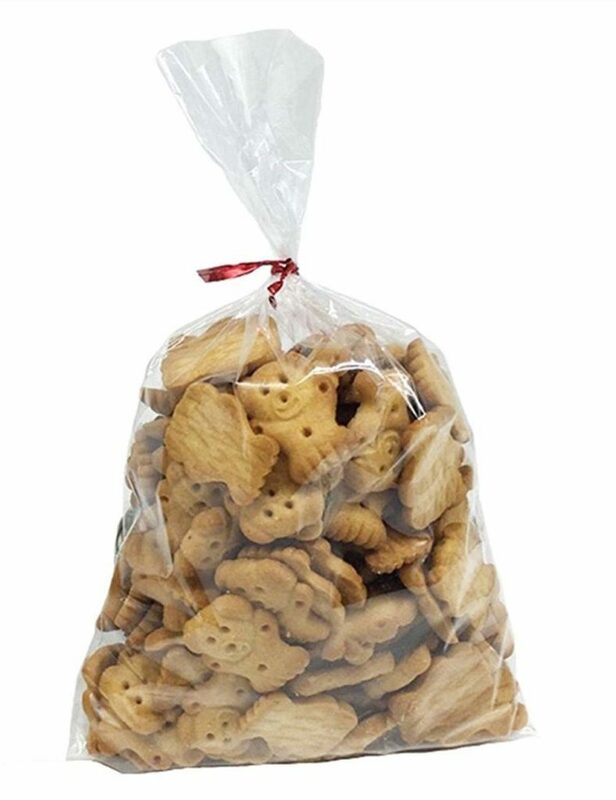 You can buy graham crackers, chocolate bars, and marshmallows in bulk and then put them all in a clear plastic bag with a customizable note for your guests. Whether you are able to make homemade jam or buy it, these jars of jam are going to make a great country style wedding favor. You can put together a couple of different flavors of jam to choose from or a specialty flavor. These are wedding favors that your guests are sure to remember to bring home at the end of the night. You will be able to customize your jars as well with a little bit of string and a personalized note as well. If DIY projects aren’t your thing, have someone else do the work for you. 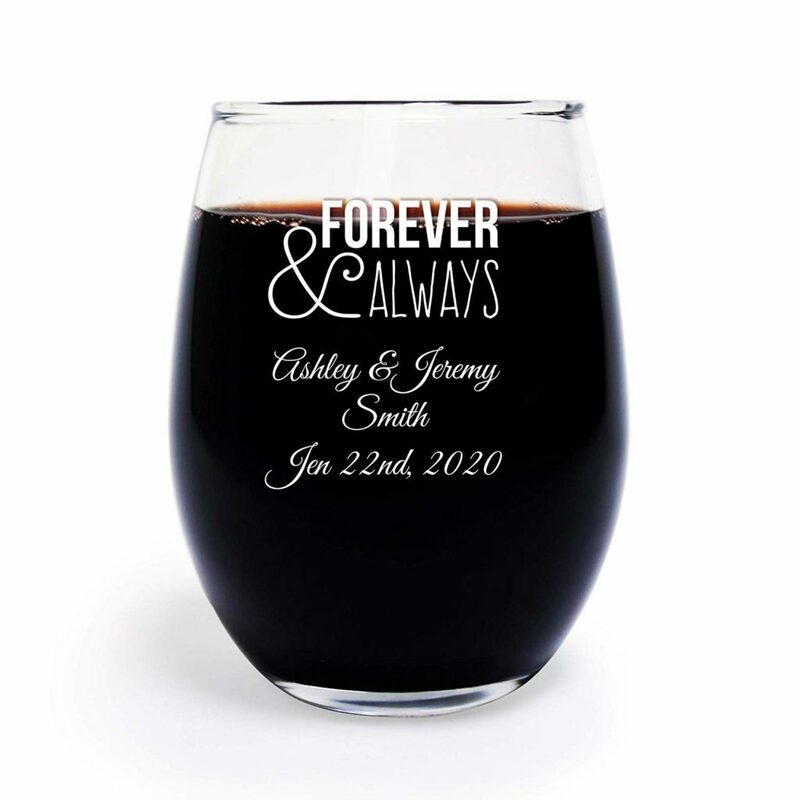 These personalized wine glasses will make great favors for your guests. For the non-drinkers on your guest list, the stemless glass can be used for other functions as well. There are a variety of fonts and personalization available as well. 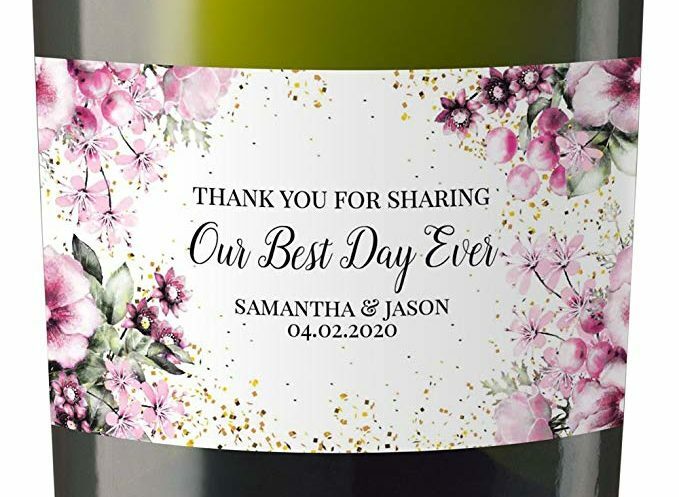 This will allow you to make sure that you have a unique and personalized wedding favor. These made to order wedding can coolers are a fun and practical favor that your guests can enjoy for years to come. A variety of colors, prints, and designs are available as well. This will ensure that these favors match your theme. And, with such a reasonable price, you may want to order some extra for yourself! Potted plants are perfect for injecting a little bit of nature into your wedding. Anything from herbs to succulents to cacti works well as a potted plant and doesn’t break the bank. As a bonus, you could also group the favors together and use them as décor for the wedding or reception. Artisan soaps both smell great and look great. 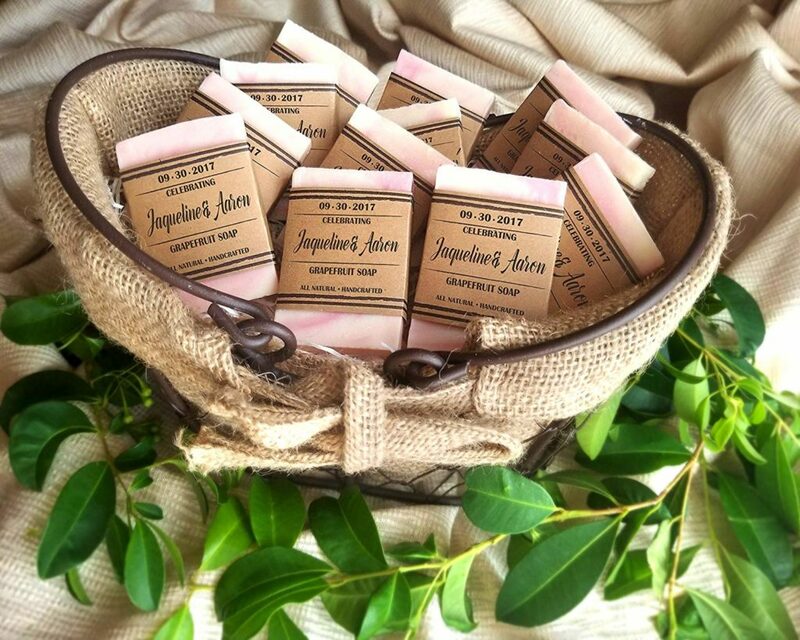 These Artisan soaps are also able to be customized. 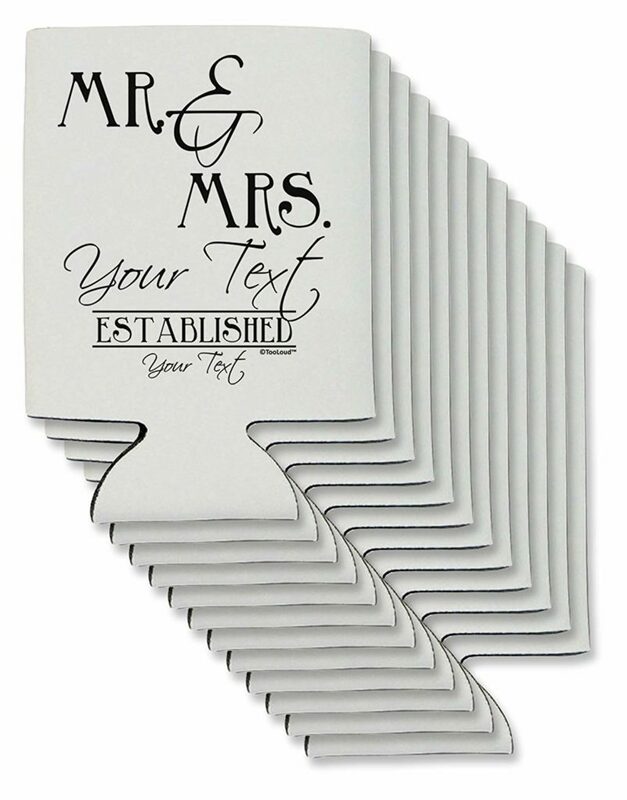 Place a personalized note around the bar, and you have a great wedding favor for your guests. If the theme of your wedding is rustic, they will fit right in. They will also be a gift that your guests will use later on. You can also decide on your favorite soap scent and color, as well as the sleeve color. Have a sweet tooth? Chances are, your guests will. So create a candy or cookie buffet! Complete the buffet with darling, personalized takeaway bags as well. Candy buffets also look great and can be a great decoration piece for a reception. If you are looking for something that is going to give your reception a little more life. Consider adding a candy or cookie buffet. Candles are a perfect year-round wedding favor. 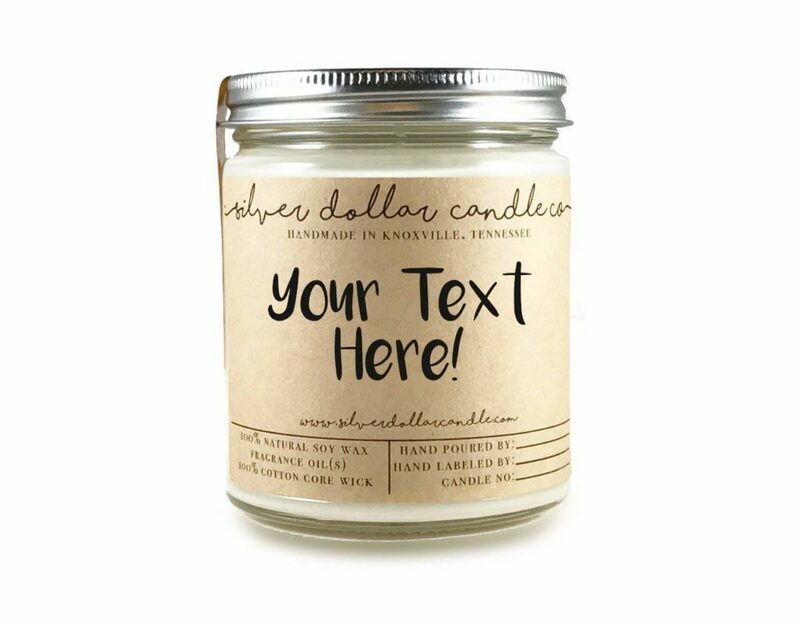 Personalized candles are going to give your gift that special touch as well. These soy candles come in the scent of your choice. They also feature a customizable ribbon and personalized label. This will allow you to get the candle that you are looking for. Have the perfect coffee blend that your guests need to try? Give them a delicious bag of coffee. 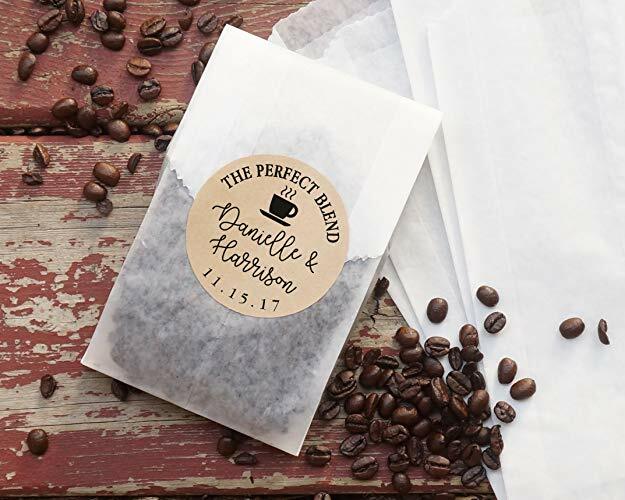 Personalized coffee bags are a great wedding favor option. A variety of fonts and colors for the coffee bags are also available. So you will be able to pair this gift up well with your wedding theme. Not sure what coffee to fill your bag with? Our list of the best coffee brands will have everything you need. 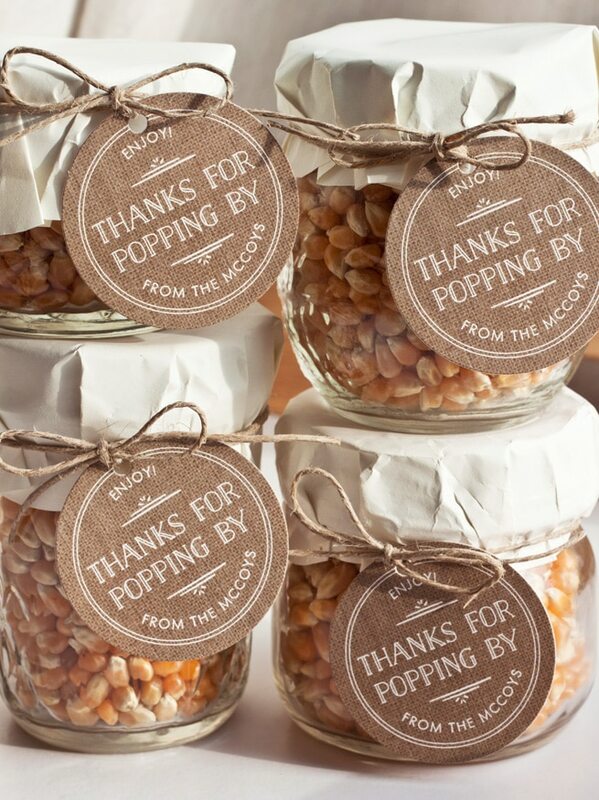 Another easy food favor option, popcorn in a jar is a fun favor for guests. If you want to take it a step further, pop and season the popcorn. Un-popped corn also works great though. Attach personalized stickers or tags for even more customization. Try out a phrase like “Thanks for Popping By” for a fun touch. Bottle openers are something that never goes out of style, especially unique ones. So give a gift that is going to have your guests remembering back to your wedding day. This skeleton key bottle opener is going to do that. Add a personal note thanking your guests as well. This will allow you to give a party favor that both looks great and will be useful for your guests. Weddings are celebrations! So why not give out a party favor that is going to remind guests of the great time they had at your wedding? These champagne flute candles are both pretty and unique. When your guests use them down the road, they will think back to the great day that they had on your big day. If you aren’t quite feeling a full candy bar, this is a great option. Give your guests prepackaged candy to take home. 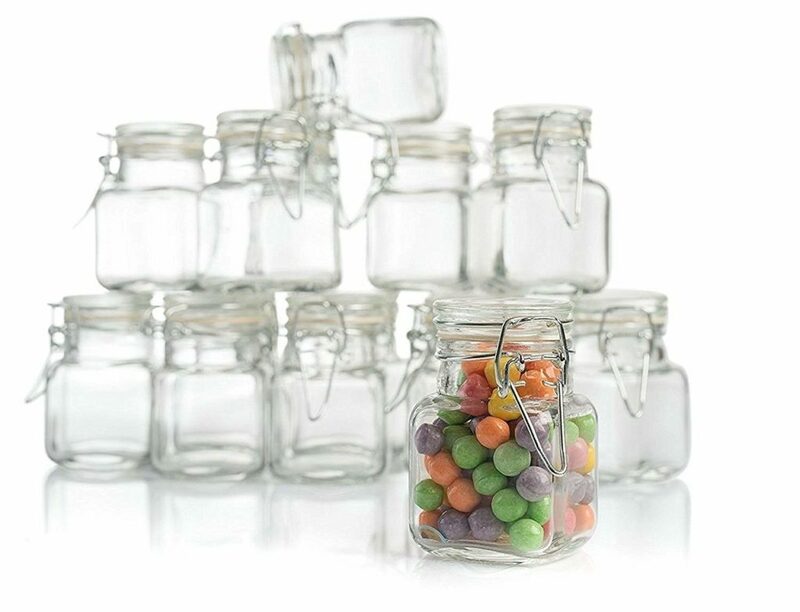 These jars will make perfect party favors, and you can fill them with all the sweets you want beforehand. Along with these classic jars filled with colored candies, try adding a personalized note to the jar as well. 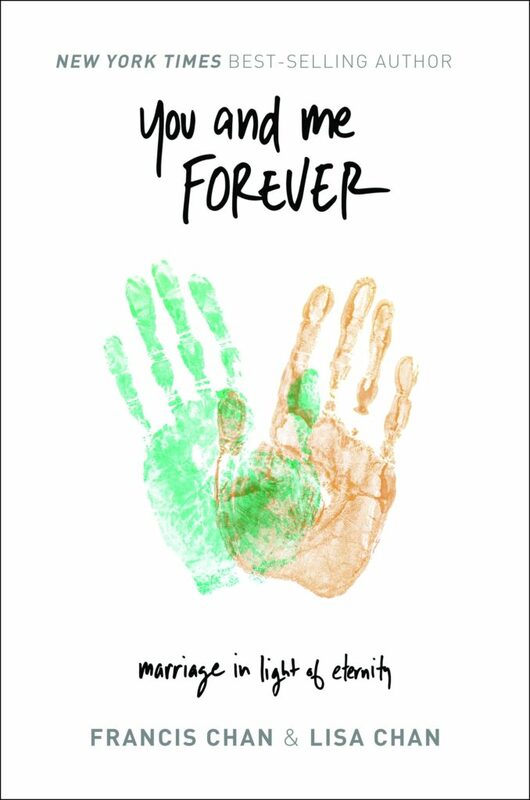 This will allow you to give a more meaningful gift. 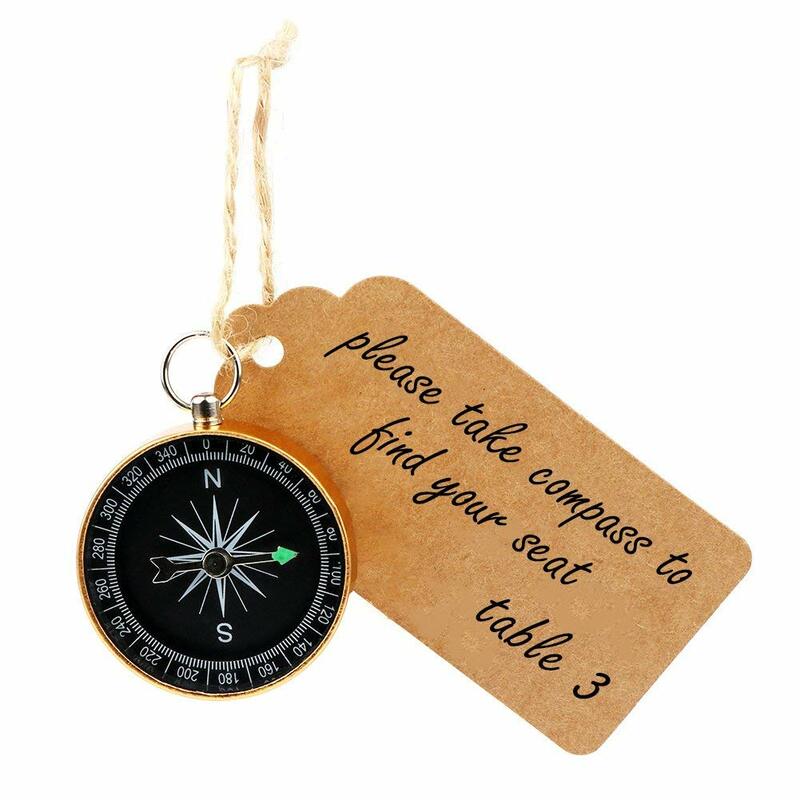 While you wouldn’t want to have to find your way out of the deep woods with this compass, it does make a great wedding favor. It is also going to be on the friendly side of your budget. These compasses are also unique enough to keep around after the wedding. So every time a wedding guest happens to see their compass, they will remember your wedding day. Looking for a gift that fits your elegant wedding style? These elegant gift boxes are going to be perfect for a variety of different gifts. Whether it is a bag of candy or cookies, a candle, or anything along those lines. This gift box is going to allow you to class up your gift and allow it to match a more formal wedding theme. Similar to the customized coffee bags. 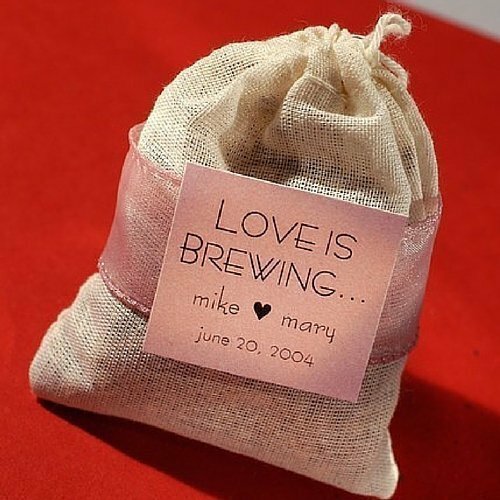 This custom tea bag will allow you to provide your guests with a tea blend of your choice and a personalized note. It is a great way to thank your guests for attending. If you are a DIY person, this gift only requires a tea bag, tea of choice, and a personalized note. So it would be easy enough to buy everything in bulk and then make them yourself. Do you have a book that speaks to you or that you think would benefit others in their pursuit of love? 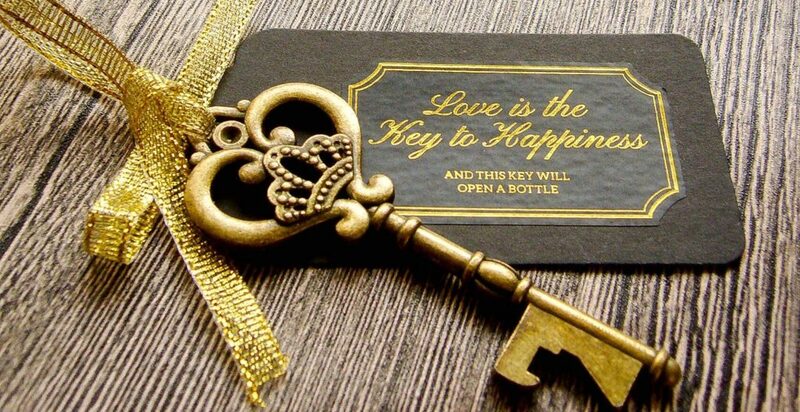 Give it out as a gift for your wedding favor. With the ability to buy books in bulk, you most likely could get the book you are looking for at a pretty good deal. Write a quick handwritten note in the cover for an added touch. A little bit more of a costly gift, this is one gift though that your guests will most likely hold on to for years to come. This gift makes a great shelf decoration. 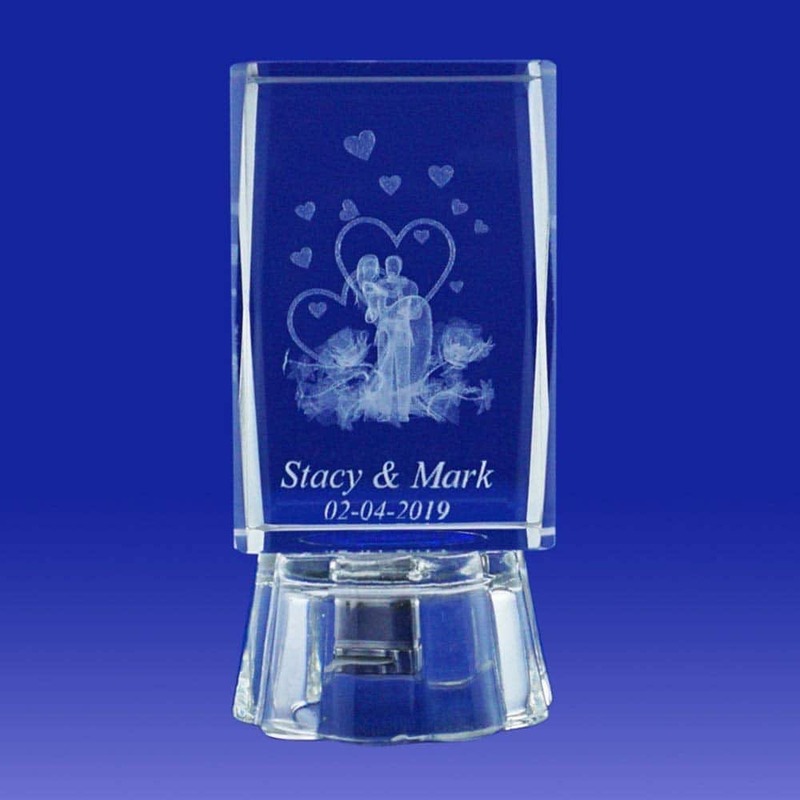 So any time your guests see the engraving after your wedding, they will be able to think back to your big day. If you are looking for a gift that is going to hold well over time. A laser etched engraving should be towards the top of your list. With smoking on the decline, matches aren’t as prominent as they used to be. They still make an excellent wedding favor though, especially when personalized. This wedding favor is also going to be price friendly. It will also allow you some personalization. If you are looking for a little more for your gift, try pairing these matches with a candle of your choice. Coasters make a great collectible and can be customized to your liking. These custom drink coasters are going to allow you to say exactly what you want to your guests. You will be able to personalize them in a way that fits your style. They are also are a little more budget friendly than some of the other wedding favors out there. Champagne and celebration go hand in hand in a lot of different ways. 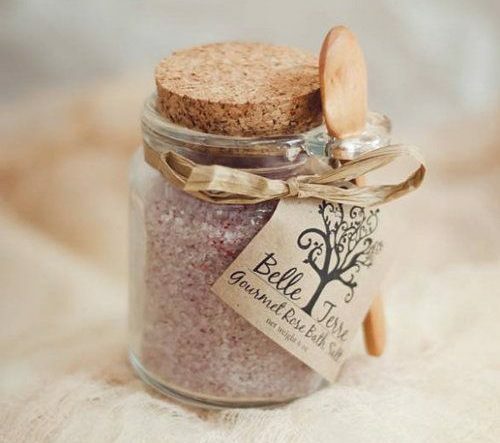 These custom labels will allow you to provide a personalized gift to your guests. It also has a celebratory touch to it as well. And, whether they take it home and drink it or place it on a shelf as decoration, it will make a great party favor. With all the candy on this list of the best wedding favors I am starting to see a trend, people love candy! 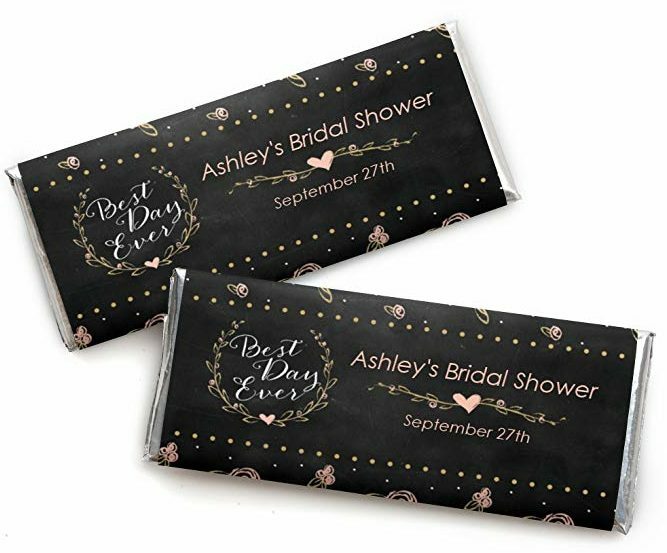 These candy bars will allow you to provide something that people love in a personalized way. You will be able to buy candy bars in bulk, remove the candy bar covering and then replace it with your custom one. That is all the assembly that this wedding favor requires. There is just something about Himalayan Salt in a jar that looks so pretty. 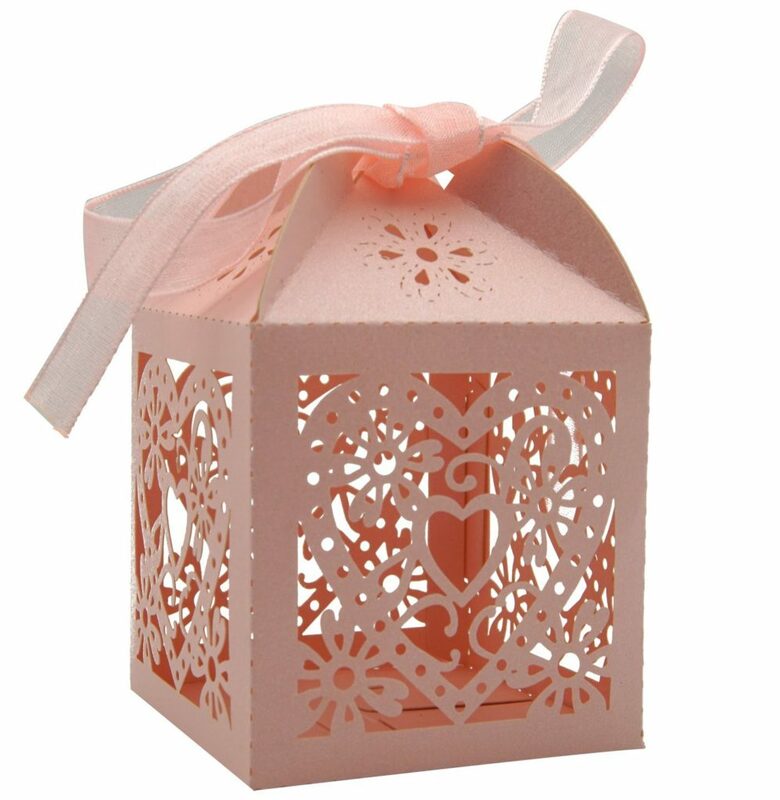 The combination of a cute jar and the pink hue come together for a great looking gift. This is a gift that will provide value with your wedding guests as they cook later on at home as well. 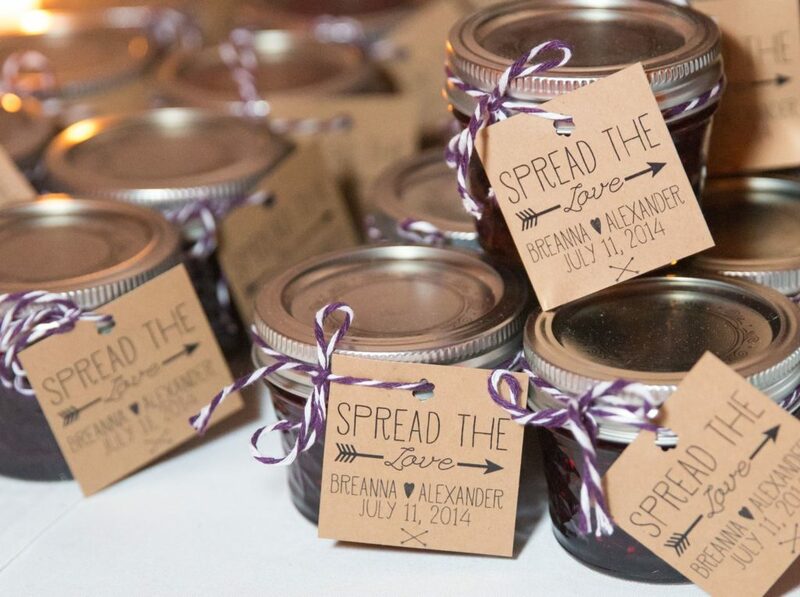 With a personalized note on the jar, your wedding guests will think of you every time that they use this gift. 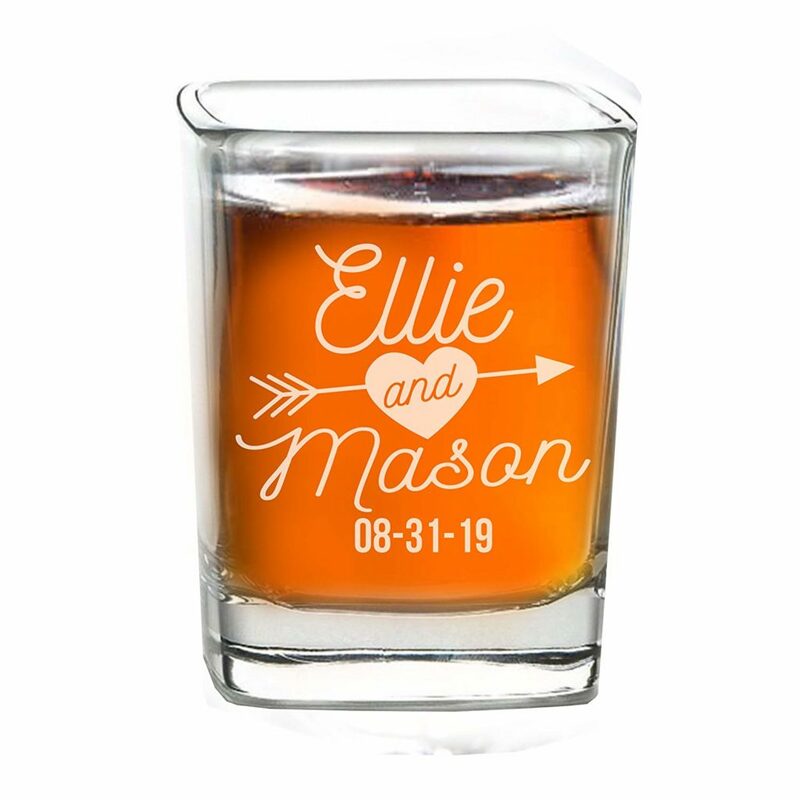 Personalized shot glasses make excellent gifts because they can also be decoratives. So it still makes a great wedding favor for non-drinkers. You can personalize the note on the glass to fit your style as well. 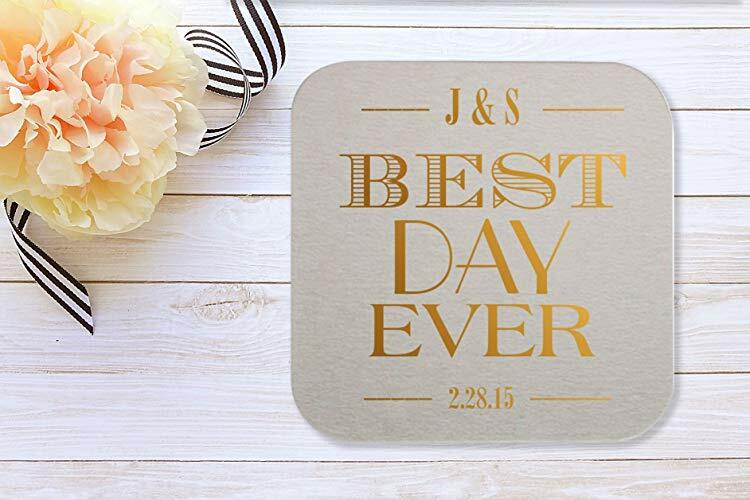 Your guests will be able to think back to your big day every time this gift is used or seen on the shelf. There are a ton of things that go into planning the perfect wedding day. Finding the right wedding favors should not be something that takes up a large amount of your time. That is why we wanted to provide a great list of wedding favors. Regardless of budget or level of crafting, this list should have something for you. For the rest of your wedding day needs make sure that you check out our list of the best wedding websites. These sites will have everything that you need to plan your wedding and make it go off without a hitch. After you give one of these wedding favors a try, let us know how it went in the comments below.